Plastic to young fish is like fast food is to teenagers, claims a new Swedish study. Researchers say that young fish have become addicted to eating plastic in the seas in the same way that teenagers have a preference for fast food. Exposure to plastic makes young perch smaller, slower and more vulnerable to predators. Their study, reported in Science, found that when perch larvae are exposed to high concentrations of polystyrene, they prefer the particles to more natural foods. The researchers have called for a ban on plastic micro-beads in cosmetics. In the recent years, researchers and environmentalists have expressed concern over the growing amount of plastic in the seas in recent years. 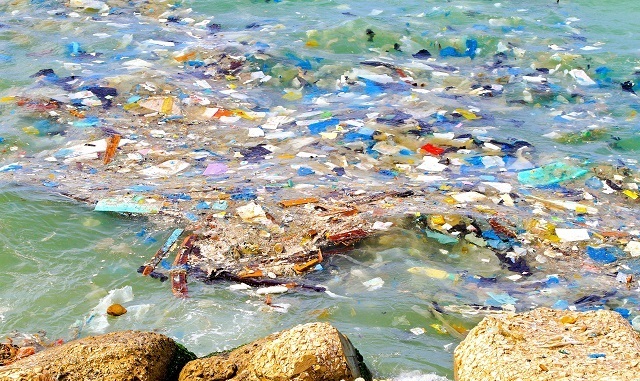 A study that came out last year revealed that 8 million tonnes of plastic waste enters the oceans annually. The plastic breaks into tiny pieces on exposure to UV radiation, chemical degradation and the movement of the waves. The particles of plastic that are smaller than 5mm are referred to as micro-plastics. The term also covers plastic micro-beads that are used in personal care products. When ingested by marine animals, the tiny fragments of plastic build up in the guts of marine creatures and can also leach toxic chemicals. For the study, the Swedish researchers exposed perch larvae to different concentrations of polystyrene in water tanks. The researchers wanted to study the impact of micro-plastics on the early life stages of fish. The study revealed that in the absence of micro-plastics, about 96% of the eggs successfully hatched. The percentage of hatching dropped to 81% when exposed to large quantities. “”smaller, slower, and more stupid”,as compared to the fish that hatched in clean waters. Also, the young perch from clean waters had better survival instincts with half of them protecting themselves from predators for 24 hours. On the other hand, pike consumed all the perch that had been raised with plastic concentrations over the same period. The research team came upon the startling discovery that eating plastic changed the food preferences of the young fish. Researchers said the new study was important in understanding the impact of plastics on marine species. “The observations we have so far are about the amount of plastic we find in the seas, and the amount we find within animals,” commented Dr Erik Van Sebille from Imperial College London. The researchers linked the decline of species such as perch and pike in the Baltic Sea to increased deaths at the juvenile stage. The US has banned the use of plastic micro-beads in cosmetic and personal care products. “It’s body care products, it’s not just toothpaste and scrubbers; some mascara and some lipsticks have plastic in them too,” said Dr Lonnstedt. Ministers in the UK have already said that if the EU cannot adopt a common position on the issue then Britain will ban plastics unilaterally. Next articleDead Island 2 – Cancel or Delayed?